The HIghest X-ray FLUx Galaxy Cluster Sample (HIFLUGCS) is an X-ray selected sample of 64 galaxy clusters from the ROSAT All-Sky Survey with a flux limit of 2 × 10 -11 erg s-1cm-2 in the (0.1-2.4) keV band and Galactic latitude |b| ≤ 20°. HIFLUGCS is the largest complete sample with full Chandra and XMM-Newton follow-up. From Chandra for all 64 clusters. From XMM-Newton for 63 clusters (not for A2244). From Suzaku for more than 40% of the HIFLUGCS clusters. From ROSAT PSPC pointing observations for 80%. Since these systems are the X-ray brightest clusters in the sky, they are also well-studied in other wavebands, e.g., in the radio and optical regime. 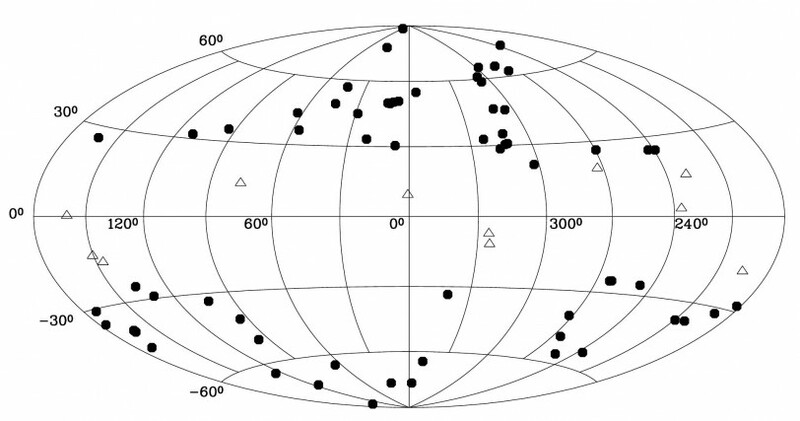 Map in Galactic coordinates (in Aitoff projection) showing the positions of the 63 HIFLUGCS clusters without RXJ 1504 (filled circles). 11 clusters above the flux limit but with b < |20°| are also added (open triangles). Image taken from Reiprich and Böhringer (2002). ADS listing of publications containing the word "HIFLUGCS"
In the near future, HIFLUGCS will be tripled in sample size resulting in the new complete high quality sample, eHIFLUGCS. This significantly increased statistics will enable substantial improvements in precision for several studies as well as qualitatively new tests.